With Spring just around the corner I’m craving a bit more color in my life! I’m ready to tuck away some of the charcoal and black in my closet in lieu of pink, yellow and crisp white! The wall color on the image above is gorgeous. I just recommended a similar shade for the interior door in my sister’s bathroom. The color I suggested was Warm Springs: by Benjamin Moore. I’ve used it before in a client’s home office. It’s gorgeous and instantly cheers up any space. A shot of Mrs. Lilien’s jewels. I’d have to agree with her advice here. “Accessorize with abandon”! 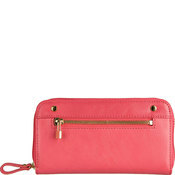 These wallet clutches are perfect for the lady on go. 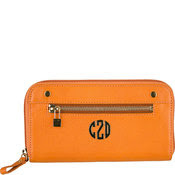 Ladybird fashion will also add your monogram at no charge. This may be a future purchase in my life. I’m loving the shift dresses shown this season!! The lines and proportions on this Michael Kors version are perfect. side note: I had a designer working on my blog header. I was so excited and have been waiting for MONTHS to have it finished up. I may need to switch gears and have someone else finish and launch my design… This is beyond frustrating as I’ve already paid for the job!!! Ugh. Hopefully I’ll have something new and colorful soon…. Image one: Lonny, others as noted. Julie I adore the 1st image…fabulous Art & color!! Come & Enter my Artful Giveaway! YES to color! i'm for it! I love that yellow Michael Kors! So sunny and perfect for spring! There's something about the colors for Spring. I'm in love! Love the colour, I can't wait for spring! Good luck with the header, so frustrating that it's partway done and yet not done enough. Here's hoping it gets finished soon. Can't get enough of color right now too!!! Oh, the first image you shared is lovely and feels so fresh right about now! Spring is coming! Color is definitely back. Love.